There are a number of ways to keep your iPhone from making noise when you've got an incoming call. Whether you do it by using the mute switch or software settings, the iPhone gives you a number of ways to turn off the ringer. This article shows you how to use all of them. The easiest way to turn off the iPhone ringer is to flip the switch on the left-hand side of the iPhone. It is located above the two volume buttons on most iPhone models. This is the iPhone's physical mute switch. Flipping the switch down so that the orange dot or line indicator on the switch is visible puts the iPhone into silent mode. Doing this will briefly display an icon of a bell with a line through it on the phone's screen. This confirms that the iPhone is now silenced. To take the iPhone out of silent mode, flip the switch up towards the front of the iPhone and the ringer will turn back on. Another on-screen icon will appear to let you know the phone ringer is once again active. Do you have phone calls showing up on your Mac, iPad, or other Apple devices and want to keep them only on your iPhone? Learn how to do this in How to Stop Other Devices Ringing When You Get an iPhone Call. Your phone playing a sound isn't the only way your iPhone can notify you that you've got a call coming in. If you'd rather not hear a tone, but still want a notification, use the vibration options built into the iOS. With them, your phone will vibrate, but otherwise stay silent, when you've got a call. Vibrate on Ring controls whether the iPhone vibrates when calls come in. Turn on this option by moving the slider to on/green. Vibrate on Silent controls whether the phone vibrates when a call comes in and the phone is in silent mode. Move the slider to green to on/enable vibration. You can get another kind of silent notification for incoming calls by using the iPhone's camera flash. Learn how to do it in How to Set Up Flash Light Notifications on Your Phone. Ringer and Alerts lets you control the volume of your ringtones and decide whether the volume buttons just under the mute switch can control the ringer volume or not. Ringtone sets the default ringtone for all calls on the phone. To override this setting, you can assign individual ringtones to contacts. Text Tone sets the ringtone or alert that plays when you receive a new text message. This can be overridden by assigning individual SMS tones to contacts. New Voicemail controls the sound that plays when you receive a new voicemail. 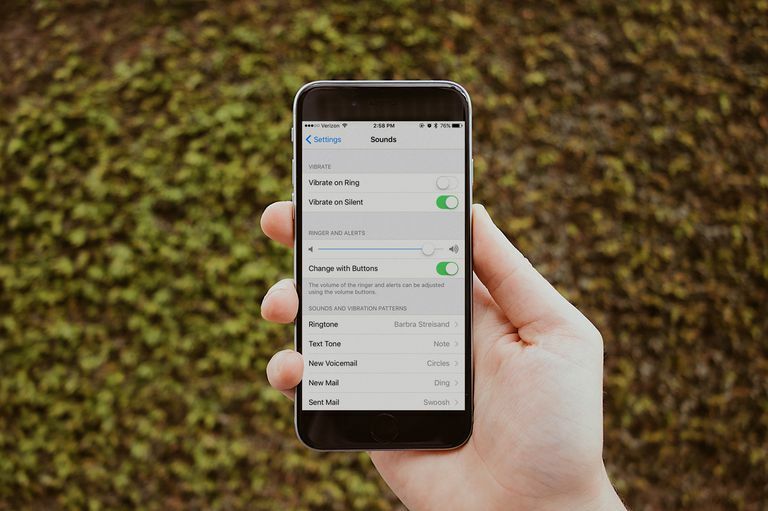 New Mail sets the alert tone that plays when a new email arrives in your inbox, this alert tone sounds. Sent Mail plays a tone to confirm when an email you send is actually sent. Calendar Alerts sets the reminder tone you'll hear when an event comes up in the Calendar app. Reminder Alerts are the same as Calendar Alerts, but for the Reminders app. AirDrop lets you can swap files with other users wirelessly via AirDrop. This sound plays when an AirDrop transfer is requested. Keyboard Clicks turns on a typewriter sound when you type on your phone. Lock Sound is the click you hear when the wake/hold button is pressed. You can turn this on or off. System Haptics controls whether the iPhone provides vibration feedback for all kinds of OS-level controls and actions. You'd think that silencing your iPhone ringer is pretty simple: the mute switch is either on or off. But sometimes things are a bit tricker. What if your ringer switch is set to on, but your phone still doesn't ring when calls come in? There are a number of things that could be causing this. You may have the Do Not Disturb feature enabled. It's also possible that you blocked the number that's calling and so your phone won't ring. For a full set of possible causes and their fixes, check out I'm Missing Calls Because My iPhone Isn't Ringing. Help! What Do the Buttons on the iPhone 6 Series Do?